The spaceborne lidar CALIOP (Cloud-Aerosol Lidar with Orthogonal Polarization) onboard the polar-orbiting satellite CALIPSO (Cloud-Aerosol Lidar Infrared Pathfinder Satellite Observations) [Winker et al., 2007] provides vertically resolved information on aerosol and cloud parameters on a global scale since June 2006 and measurements are still ongoing. CALIOP is a backscatter lidar operating at 532 and 1064 nm. For the data analysis of measurements of this simple backscatter lidar general assumptions on a fixed lidar ratio (extinction-to-backscatter ratio) are required in order to obtain the particle extinction coefficient or the AOT (Aerosol Optical Thickness). From advanced ground-based lidar measurements optical parameters (like the lidar ratio) characteristic for different aerosol types can be derived without assumptions of predefined lidar ratios. 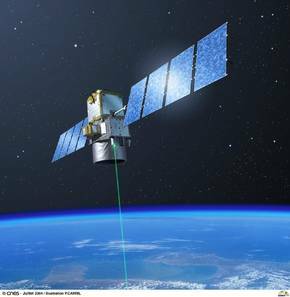 The results of ground-based lidar measurements are used to validate space-based lidar observations and to verify the satellite-based aerosol typing in detail. This work shall also support the harmonization of continuous global observations from space with different sensors over the next decade. A correlative set of data taken in the frame of EARLINET (European Aerosol Research Lidar Network) and spaceborne lidar observations with CALIOP onboard CALIPSO has been collected and are exploited. Mostly data from sixteen EARLINET stations participated in a special ESA study (ESA-CALIPSO project - “EARLINET's Spaceborne-related Activity during the CALIPSO mission”) are used which provide measurements at multiple wavelengths performed during CALIPSO overpasses [Wandinger et al., 2010]. The aerosol classification has been evaluated in detail, based on a critical assessment of the CALIPSO typing schemes and built on the expert knowledge within EARLINET and the experience of the partners gained in field experiments around the world. Lidar observations together with detailed airborne in situ measurements performed in pure dust in the Saharan dust plume over Southern Morocco and Cape Verde during the SAMUM campaigns were compared to CALIPSO observations, especially to focus on the influence of multiple scattering on dust observations from space. OCEANET-Atmosphere: Measurements done with the portable multiwavelength Raman and polarization lidar PollyXT aboard the Research Vessel (RV) Polarstern during meridional transatlantic cruises like performed in 2009 and 2010 as well as aboard the Meteor are used for comparison studies as well. An example of such a comparison is shown in Figure 2. Backward-trajectory calculations are utilized to determine the region and time, when the lidar aboard Polarstern measures the same air mass as CALIPSO (Fig 2c). The comparison of the retrieved optical data of both instruments is shown in Fig 2a+b. Fig. 2: Profiles of (a) particle backscatter coefficient and (b) extinction coefficient at 532 nm of CALIOP data subsets from 30 October 2009, 14:53 UTC (black, profiles 1686 to 1749), 31 October 2009, 03:05 UTC (cyan, profiles 2750 to 2803), and 31 October 2009, 15:36 UTC (magenta, profiles 2706 to 2819), and derived with Polly-XT on 31 October 2009 between 3:20 and 05:20 UTC (green). (c) Map of the overpasses of CALIPSO (thin white lines), HYSPLIT 72-hours forward and backward trajectory ensembles starting on 31 October 2009 at 4:20 UTC (colored lines), periods of observations of CALIOP (thick solid white lines) used for comparisons, and the position of the RV Polarstern (red star and red arrow). From the EARLINET–CALIPSO comparison studies we found that cloud-aerosol discrimination is a very critical issue. Problems occur in particular for thick dust layers and thin ice clouds (with optical thicknesses of the order of 1–2), because these targets exhibit very similar optical properties which leads to misclassification. Another critical point is the occurrence of mixtures of pure aerosol types which plays an important role but is not sufficient considered in the CALIPSO algorithms. We also found that multiple scattering is an issue, not only for clouds but also for aerosol, in particular mineral dust. Multiple-scattering effects are controlled by the particle size. Wandinger et al. 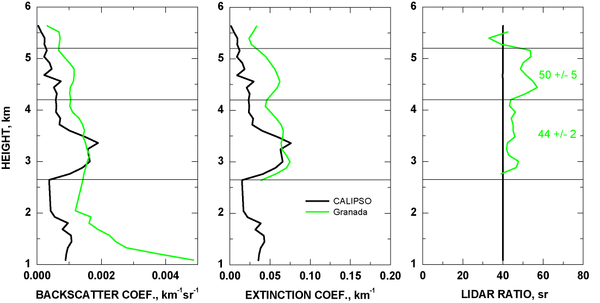 (2010) show that CALIOP underestimates extinction coefficients up to about 30% in the case of Saharan dust plumes over the North Atlantic due to ignoring the significant multiple-scattering effects caused by forward scattering of large dust particles. An example of a measurement taken at Granada on 5 July 2008 is presented in Fig. 3. Dust was observed in different layers up to about 6 km height. The lidar ratio measured from ground is larger than the CALIPSO a priori value, especially in the layer between 4.2 and 5.2 km height that could be traced back to the Western Sahara. The difference of the extinction coefficients in this layer is 20% larger than the difference of the backscatter coefficients. data for the overpass at 02:27 UTC. Two dust layers are indicated by horizontal lines. Although such kinds of satellite measurements improve the knowledge on aerosol optical properties on a global scale there are still lacks of knowledge due to the performance characteristics of the satellite: The satellite revolves around the earth with a speed of 7 km s-1 and performs measurements with a spatial resolution of 5 km [Kacenelenbogen et al., 2011]. The same footprint is observed every 16th day which inhibits the observation of short-term developments and atmospheric processes such as cloud evolution or the diurnal cycle of the boundary-layer development. Advanced ground-based lidar measurements are used to validate results from CALIOP onboard CALIPSO. It is the first lidar in space but there will be more. The ADM–Aeolus (Atmospheric Dynamics Mission–Aeolus of the European Space Agency ESA) and EarthCARE (Earth Clouds, Aerosols and Radiation Explorer of ESA and the Japan Aerospace Exploration Agency JAXA) missions will continue and extend spaceborne lidar observations in subsequent years. For this missions 355-nm high-spectral-resolution lidars (HSRL) will be applied being different from CALIPSO with its simple backscatter lidar operating at 532 and 1064 nm. For the harmonization of global observations from space with different sensors over the next decade so called wavelength conversion factors also gained from advanced ground-based lidar measurements at multiple wavelengths can be used. Winker, D. M., W. H. Hunt, and M. J. McGill, 2007: Initial performance assessment of CALIOP. Geophys. Res. Lett., 34, L19803. doi:10.1029/2007GL030135. Wandinger, U., et al., 2010: Size matters: Influence of multiple scattering on CALIPSO light-extinction profiling in desert dust, Geophys. Res. Lett., 37, L10801, doi:10.1029/2010GL042815. Kacenelenbogen, et al., 2011: An accuracy assessment of the CALIOP/CALIPSO version 2/version 3 daytime aerosol extinction product based on a detailed multi-sensor, multi-platform case study, Atmos. Chem. Phys., 11, 3981-4000, doi:10.5194/acp-11-3981-2011.